My family is planning to go to Hongkong on Sept 9-12, 2011. I would appreciate if you could provide me with an itinerary (including how to get there and fares) that could maximize our time. I would like to ask for our itinerary. we will be arriving in Hong Kong airport at 1000H and will be staying in Metropark Hotel Kowloon. We would like to maximize our stay and visit Ocean Park, Disneyland, Macau and Hong Kong tour. Plus shopping maybe at night time. Please suggest how can we manage our time and money for all of these. I am sure you will love your stay here. We will be on HK this coming Jan 20-24. We’ll arrive at 10:30am Jan 20 and depart HK at 10:30am Jan 24. We will stay at the Kimberley Hotel in Kowloon. We plan to go to Disney, Ocean Park, Avenue of the Stars, Victoria Peak, Ngong Ping, Madame Tussauds, to some temples/museum and do some shopping for souvenirs.. Plus a side trip to Macau. I am going to hong kong for 5 d and 4 n. I will be staying at Kimberly Hotel. I would like to visit victoria peak, disneyland and ocean park or any other attractions in hong kong as well as shopping. Can you please advice me on how to maximise my time there. Tq. Hi, we'll be coming to hongkong on may 27, we'd like some help on how to get to disneyland and ocean park from the kimberley hotel. thanks! Hi! Me, husband and 2 kids ages 8 and 5 will be travelling to HK on May 1 - 6, can you advise for budget but comfortable hotel or guest house where we can stay? We are planning to go to HK Disneyland and Ocean Park mainly and also the different tourist attractions in HK. And lastly, I hope you can also help us with our itinerary, directions and tips. End of this thread and posting comments! To our valued site's visitors. Please be informed that we're NO longer accepting comments and answers on this thread as it goes too long already. For your inquiry, please click the 2nd link below to write your own inquiry page. Thank you and we apologize for any inconvenient. hi,can you help me with out IT? we're arriving in HK on mar11, 6:40pm and our flight back to manila is mar14 11:30pm..
And another question, which is better Octopus Card or the Aiport express Card 200 HKD? Hi. I plan to visit HKG from 22nd May 2013 to 29th May 2013. Can you please suggest me with itinerary to see Disney Land, Ocean Park, Macau and the best hotel to stay with day wise plan for effectively utilize this vacation with my wife and 2 children ( age : 10 & 4 ). I will be in HKG international airport on 22nd May 2013 and leaving HKG on 29th May 2013. Hi, it will be my first time to go to Macau. I would just like to ask what would be the easiest and convenient way in going to Macau from HK Airport. My wife and I will be arriving in HK around 10am on Wednesday Feb. 20,2013 in HK airport. We will be back in HK the next day, Feb 21 around after lunch. Can you suggest an itinerary in going to outlet stores and nice food stalls where to eat until lunch time of Feb 23. Not the fine dining expensive kind of resataurants but more of the noodles, dimsum and clay pot rice or toppings kind of restaurants. - how can we get to hk disney land from our hotel? And transportation rates please. - aswell as ocean park. - and were planning to go to macau for a day, how can we get there from our hotel? And what time in the morning is the first trip of the ferry boat to macau? As well as wat time is the last trip in the evening?? Hope i could hear from you the soonest! I would really appreciate it. Any way thank you in advance for helping.. I'm going HK with my two kids. I'll be staying at Kimberly Hotel for 2N and last nite at Disney Hollywood. Once we reach HK, we gonna head down and check in to Kimberly Hotel. Since we reach the hotel around 2pm. Where is the nearest place that I could go for sight seeing, shopping & dinner? On the 2nd day, I'm planning to go Ocean Park (does it requires full day to tour around the park) Intended to take the MTR to Ocean Park, is it convenient? How much is the fare and how long is the journey from the hotel to Ocean Park? On the 3rd, we gonna spend the whole day at Disney Land and check in to the Disney Hollywood Hotel. On the last day before we gonna catch our flight back at 2pm, is there any time for us to do last minute shopping around the area? I hope you could help me during my stay there. We will arrive on may16at 10:30am,and leave on may 19 @ 16:00.We'll be staying at disney's Hollywood hotel.we have kids with us and we want to go to disneland,oceanpark,ngonG ping 360 or Noah's ark. And also to citygate outlets. What's the best way getting around. First, I would suggest you stay at TST area, like the most popular is the Mirador Mansion and here's how to get there from HK airport. --> TST promenade to visit Avenue of Stars and watch the nightly show - A Symphony of Lights at 8:00pm (MTR Tsuen Wan Line from Mei Foo to Tsim Sha Tsui station Exit F, 16 mins @ HK$6.7). --> Street Markets - Temple Street Night Market (MTR Tsuen Wan Line from Tsim Sha Tsui to Jordan station Exit A, 3 mins @ HK$3.8). April 21: You can go for Noah's Ark in the morning and head to Disneyland after lunch and explore the whole park until evening to watch the fireworks show at 7:00pm. Or, whole day at Ocean Park then maybe a finale at DHL HK Balloon and Sky100 at Kowloon station. Note that either Disney or Ocean Park offers its visitors a whole day activity. Personally, I would recommend Ocean Park, more attractions and more fun. Lee Garden Guesthouse (pls follow link to view hotel location map) located at 34-36A Cameron Road. Tsim Sha Tsui, Kowloon, Hong Kong. It is about 3 mins walk to the TST MTR station Exit B2. TST MTR Tsuen Wan Line to Admiralty station (5 mins $ HK$8.1) then take Exit B --> bus 629 straight to Ocean Park entrance (25 mins @ HK$10.6). 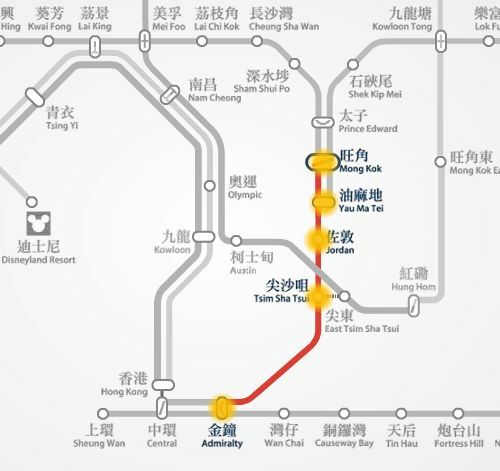 TST MTR Tsuen Wan Line to Lai King station --> change to Tung Chung Line to Sunny bay station --> change to Disneyland Resort Line to Disneyland station (38 mins @ HK$17) and then take Exit A. Take about 12 mins walk to the TST Star Ferry (or a short taxi drive @ HK$20) --> Star Ferry to Central (9 mins @ HK$2.5) --> Central Pier Bus terminal and take bus 15C to Peak Tram Lower terminal (10 mins @ HK$4.2) --> Peak Tram to the Peak. Pls follow same travel route in getting back to Lee Garden in reverse order. Hi could you assist my family in with our itinerary for this coming April 19- 22. April 19 : 955am arrival plan to settle in apartelle and around noon head to. Don't know which one is worth seeing but would like to do the Noah's Ark with either Disney or Ocean park. Would greatly appreciate an economical and budget trip advice. thank you! Hi! Will be arriving on the 27th an will stay on lee garden guesthouse cameron road. Pls give me directions on how to go to ocean park, disneyland and the peak from lee garden, thanks. Stanford Hotel Hong Kong (pls follow link to read more hotel info or you may scroll up to the post dated Jun 28, 2011 to see hotel location map) is rated 3-star hotel located at 118 Soy Street Mongkok Kowloon, Hong Kong. It is about 3 minutes walk to the famous Ladies market and 8 mins walk to the Mong Kok MTR station Exit E2. Please try to read thoroughly this thread from the very top of this page to give you an idea what attractions are you probably visit in your 6 days including some with in proximity with your hotel location. Basically, the main attractions like Disneyland, Ocean Park, etc are already mentioned above also with the getting there instruction from Mong Kok MTR. Later, you're welcome to add another comment for any further specific inquiry. Here's my suggested itinerary to maximize your trip, please get to this thread post dated Jul 01, 2011. On your third day, get to the Ladies' Night Market from Ngong Ping while on your last day, spend the whole day at Macau. Here to read more about getting to Macau (post dated Mar 15, 2011). Here's a travel route in getting to Kimberley hotel from HK Airport (post dated Nov 07, 2011). Good day! I would like to ask a favor. Can you please help me with planning an itinerary for Hong Kong? Plus a whole day tour in Macau? We're all adults and we'll stay in HK for 4 days and we've booked Kimberly Hotel. Thank you so much. I would suggest you read this post first (dated Oct 24, 2011) to let you know a travel option from HK to Macau, Macau to Shekou, Shenzhen then Shenzhen back to HK. Then you may ask further specific questions based on it. Park Hotel Hong Kong (follow link to get access to hotel map) is rated 4-star hotel located at 61-65 Chatham Road South Tsimshatsui Kowloon, Hong Kong. From the hotel, walk about 5 mins along Cameron Road --> get into the Tsim Sha Tsui MTR subway station thru Exit B1 --> take the Tsuen Wan Line trains and get off just to the next station - Admiralty station (5 mins @ HK$8.1) and take Exit B --> get into the Bus no. 629 for 25 mins @ HK$10.6 travel to Ocean Park entrance. Just follow the same travel route in reverse order in getting back to the hotel. Can someone assist me how to go to Ocean Park from Park Hotel and its price by public transport. I will travel to Hong Kong in May 2012. Pls assist us, we are on a hk tour package, part of the tour is to go to ShenzHen, however, we want to go to Macau and back to hk on our own. Pls instruct us how to go about it. Is there a train or ferry boat from ShenzHen to Macau, and is there train or ferry boat to HK from Macau. How much will it cost us to take the train or ferry boat to each destination? We are 5 in the tour. Here are your best options in getting to Macau Ferry Terminal in Sheung Wan, Hong Kong Island from Anne Black YWCA Hotel (in any order, it depends on your preference). 1) Taxi. To avoid long walks, take a taxi straight to the ferry terminal from the hotel. It takes only about 16 minutes drive @ HK$75. 3) MTR + Star Ferry. Take MTR Tsuen Wan Line from Mong Kok (Exit D3) to Tsim Sha Tsui station (Exit F), 7 mins @ HK$4.6 --> take the Star Ferry from TST to Central (9 mins @ HK$2.5) --> take less than 10 mins walk to the Ferry terminal. Taxis in HK can accommodate to a maximum of 5 persons and still very comfortable with no limit in no. of luggage. From Kimberley hotel to Hong Kong airport by taxi is about 33.9 km, 37 mins drive @ HK$260. The Airport Express tickets are specified according to the route. If you wanted to use it in going back to Hong Kong airport from the hotel then you should specify that you wanted to buy the "Kowloon --> HK Airport" route when you purchase the ticket. In your first day, first you may go to Noah's Ark in the morning and head to Disneyland perhaps after lunch and stay there until evening. Here's the getting there instruction. 1. May we know maximum # of passengers and luggages allowed in Hk taxi as we are 4PX and how much approximate fare will be from Kimberly to Hk airport? 2. Can we use the single journey ticket when going back to HK airport from Kimberly hotel ? because we plan to go straight to disneyland using octopus card and will ride the mtr in going to our hotel at TST Kimberly hotel. 3.How can we maximize our time in going to Noah's ark if we will go to disneyland, ocean park, Victoria peak during our 4d/3N tour. Yes Susan, purchase an Airport Express return ticket for efficient travel between HK airport and to the hotel and then buy an octopus card and use it to explore HK. Note that the Airport Express ticket will be used when taking the FREE Airport Express Shuttle Bus otherwise an octopus card alone is enough. An octopus card will costs HK$150, which have inclusive of a HK$50 refundable deposit and HK$100 stored value and you can easily add value to your octopus card like HK$50 at any MTR station or any convenient stores like 7-Eleven. Since our stay in Hongkong is 4d/3N at Kimberly Hotel, pls confirm if we will just buy the round trip ticket @ HKD 160 you mentioned to ensure us fastest way from airport to hotel and back to airport on 4th day, and we will buy octopus card for other travels to disneyland, ocean park, Victoria peak and other areas for sightseeing and shopping. Can you give us an idea how much value will we be buying for the Octopus card? thank you again. Re: Queries on travel cards & where to get roast goose within Kimberly hotel vicinity? There's NO other trains that operates to and from HK airport other than the Airport Express Trains which is also owned by MTR Corp. The FREE shuttle bus is an extended service to all Airport Express train passengers only, so that means you need to purchase an Airport Express train ticket to get into the shuttle bus. In your case, I would suggest you purchase a Round Trip ticket (Airport-Kowloon station) which can be used for 1 return journey on the Airport Express between Airport and Kowloon station. The ticket is valid for 30 days from date of issue @ HK$160.0 and you need to present the ticket when you take the free shuttle bus and octopus is not valid for the free shuttle bus. Please be aware that there's NO "free airport bus" only there's "free Airport Express (train) shuttle bus" example route K4. You may return your octopus card and obtain a refund at any MTR Customer Service Centre that can be found in most of the MTR stations and at the Airport Express counter at the HK airport arrival hall. To be eligible for a refund, the returned card must be in good condition and have a remaining value not exceeding HK$500. If not, your card will be sent to Octopus Cards Limited for further handling. If returning an Octopus Card within three months of its issue date, you will be required to pay a refund handling fee of HK$9. Here's to read about the location of well-known restaurants close to Kimberley hotel and around TST area and how to get there. Queries on travel cards & where to get roast goose within Kimberly hotel vicinity? Thank you for the information on how to get to our Kimberly hotel from HK airport thru the airport express train (is this same as mrt ride? ); since we will be staying 4 days, is it suggested we buy the single journey ticket or the tourist day pass for one day usage of mtr & lrt? or outright the octopus card. Pls confirm taking of K4 free airport bus from luxe manor hotel to kowloon station and using the octopus card in taking us back to Hk airport, is there a refund facility in the airport for the octopus card or is their an expiration for unused load for certain period? First, to know the exact location of The Kimberley Hotel Hong Kong, please scroll up to the post dated July 01, 2011. Most instruction in getting to the popular attractions that you've mentioned to and from your the hotel is also mentioned on that thread. If you wanted to take the train from HK airport to your hotel, here's an efficient way to do it. Take the Airport Express train from HK airport to Kowloon station (21 minutes @ HK$90) --> take the free Airport Express Shuttle Bus (K4) from Kowloon station and get off at The Luxe Manor Hotel Hong Kong (located close to Kimberley hotel, please follow link to see hotel map) --> take a short walk to your hotel. Hope it helps and enjoy your HK trip! Hi, we would be travelling to HK on April 27 arrived 10 am, booked at Kimberly hotel, tsim sha tsui area, pls give direction in going to the hotel by taking mtr from airport, then how to go to ocean park, disneyland, Victoria peak. Where to get roast goose bring back to Philippines. We will go back to Manila on Apr 30 at 6 pm flight. Will one octopus card be enough for the 4 day travel? It's already stated above, get back to Admiralty station and take the Island Line going to Chai Wan then get off at Fortress Hill, exit B. Follow the same walking directions above. Thank you so much for your reply...really of help. One thing more, pls provide us with instruction on how to get to our hotel from Ocean Park. Here's a travel route in getting to HK Airport from Macau. Take the Airport Express trains from HK Airport all the way to the last station, Hong Kong station. Interchange trains at Central station. Take the Island Line going to Chai Wan and get off at Fortress Hill station, exit B (44 minutes at HK$100). Walk 2 minutes to Yesinn (head northeast on King's Rd towards Fortress Hill Rd and turn left onto Power St then turn left onto King's Rd, destination will be on the left). To Ocean Park from HK Airport: follow the same route from above but get off at Admiralty station instead (next station from Central station). Take exit B. Upon exit, get on the special CityBus CTB 629 for about 25 minutes bus ride @ HK$10.6, an express bus travel between Admiralty (west) and Ocean Park (main entrance). Get back to Admiralty station and take trains, Island Line going to Chai Wan and get off at Fortress Hill, exit B. To Macau: Take the Island Line going to Sheung Wan and get off to that last staton, exit D.
Reception: Flat B, 15th Floor, Front Block, Continental Mansion, 294 King's Road,, Fortress Hill, Hong Kong Island. How to get there from HK airport. Actually, we will arrive in HK at around 1:30 pm. And if we proceed to Ocean Park from airport, please help us how to get there...and from Ocean Park to our hotel. Lastly, would appreciate your assistance in going to Macau from our hotel. And schedule of ferry to Macau and back. You may go visit Ocean Park on the 28th (if your arrival is in the morning) or the 30th. Like Disneyland, Ocean Park and Macau require a full day activity. The last ferry trip from Macau to HK is 10:30pm if you intend to get back to HK on the same day which is on the 29th. If you opt to go to Ocean Park on the 30th, i suggest you leave the park at 3pm because you have to be at the HK airport atleast 2 hours before your flight. You may or you may not avail of the Octopus card. You may use tickets if you have none. To get to your hotel in HK, you may take the Airport Express trains or airport buses. Would appreciate your suggestions if we visit Hongkong on Jan 28 overnight then proceed to Macau on the 29th and back to HK on the 30th. We intend to go to Ocean Park as we failed to visit the place last time. How do we go about with our proposed itinerary. Or do you think going straight from HK to Macau is more appropriate and stay in Macau for 2 nights instead and just visit Ocean park on the 30th (before going to airport - our flight back to the Philippines is 5:45pm). Is octopus card still needed or an Express train? Thank you so much for your usual assistance. Victoria Harbour (where you can find the Avenue of Stars) is just a 10-minute walk from Kimberley Hotel. Just follow directional signs. Getting to the Ladies' Night Market from Tsim Sha Tsui promenade, take MTR Tsuen Wan Line trains from Tsim Sha Tsui station to Mong Kok station and take Exit D3 (7 minutes @ HK$4.6). Here's a travel instruction in getting to Ocean Park from your hotel in TST. Getting to Macau from your hotel, take a short walk to the Hong Kong China Ferry Terminal following directional signs or take a short taxi drive. i booked a flight and a hotel for chinese new year in HKG. i have my itinerary done but my problem now is how to get from our hotel to the different places we want to visit. help! we are staying in kimberley hotel. day 1. how do we get to the avenue of stars and then to victoria harbour? and then to a night market? it can be ladies market or temple street night market. day 2. how do we get to ocean park from the hotel and vice versa? day 3. how do we get to macau? Park Hotel Hong Kong and The Kimberley Hotel Hong Kong are rated 4-star hotel located at 61-65 Chatham Road South Tsimshatsui Kowloon, Hong Kong and at 28 Kimberley Road, Tsimshatsui, Hong Kong respectively. Both are about 5 minutes walk from Tsim Sha Tsui MTR station Exit B2. Please click the links and read reviews about the hotel to give you more insights to what hotel is best according to your preference. hi there! pls. give me feedback which hotel i cant get ineed a feedback ASAP need to booked between THe Park hotel or kimberley hotel. thanks!!! Park Hotel Hong Kong is rated 4-star hotel located at 61-65 Chatham Road South Tsimshatsui Kowloon, Hong Kong. About 4 minutes walk from Tsim Sha Tsui Exit B2 along Cameron Rd. While Shamrock Hotel Hong Kong is rated 3-star hotel very conveniently located at 223 Nathan Road Kowloon, Hong Kong. Just steps away from the Jordan MTR station Exit C1. Personally, location wise, I would prefer Shamrock Hotel. Please click links to read more details and reviews of each hotel to make your choice suit your preferences. Getting to Macau straight from Hong Kong International Airport (HKIA) has been made easy! Upon arrival at HK airport, you can transit to a Ferry at Skypier and pickup your luggage when you get into Macau. Also, here's a hostel recommendation or see option for budget hotel in Macau. Macau is just a small place and most of the popular attractions are walking distance to each other but if not, a short taxi drive is efficient (bus would kill your time - not recommended). Actually, if you travel light (no bulky luggage), you can proceed your tour right away from the Macau Ferry Terminal like going to the Fisherman's Wharf, Macau which is just few minutes walk to get there and for the rest, please refer to the map below. A visit to Macau is NOT complete without at least one stop at a casino. For Los Vegas resort style gambling, visit the recently completed Wynn Macau, or the popular Sands Macau or Venetian Macao Resort Hotel. PLEASE TELL ME HOW TO GET TO MACAU FROM PHILS VIA HK. MY FAMILY (WE ARE 3) WOULD LIKE TO VISIT MACAU ON JAN 28-30, 2012. WE WILL GO STRAIGHT FROM MACAU FROM THE AIRPORT AROUND 1PM...WE PLAN TO STAY IN MACAU FOR 2 NITES AND BACK TO HK EARLY ON THE 30TH. ANY SUGGESTIONS LIKE THE CITY OF DREAMS AND DANCING WATER? DO WE STILL NEED OCTOPUS CARD IN MACAU? AND PLS CAN YOU SUGGEST CHEAP BUT COMFORTABLE HOSTEL? pls help me to choose between shamrock hotel and park hotel.thanks! We will go straight to Macau upon arrival in HK but would probably be back in HK early on the 30th to see some places we failed to visit last time. Would love to hear your suggestions please. I think you're not be advised for travel because they said the passport should be valid at least six months from the date of your entry (to HK). hi! tomorrow is my flight mg philippines passport will expire on feb 28,2012 iwe will have tour in hk for 4 days.Do u think the immigration will allow me? HI! I JUST WANT TO KNOW THE WEATHER THERE ON THE END OF OCTOBER? WE WILL BE STAYING IN HK ON OCT 30 TILL NOV5 .THANKS! It is good to know about your successful Hong Kong visit. For your coming trip to Macau, I want to know if you still want to stay in Hong Kong or you'll go directly to Macau from HK airport. Thank you for your help during my Hongkong trip with family last month. Would appreciate if you could also provide me with sample itinerary and probably cheap hotel in Macau. Our schedule in Macau would be jan 28, 2012 and be back on the 30th late pm.. our arrival in HK from the Phils would be 1:10pm on jan 28. And of course how to get to MACAU via HK. Here's the route map from Shamrock hotel to the nearby popular Temple Street Night Market and further up north of Nathan Rd., you'll get to Yau Ma Tei and then to Mong Kok where you can find the Ladies' Market at Tung Choi St.
HI ! YOU SAID THAT SHAMROCK HOTEL NEAR THE POPULAR STREET MARKET CAN U GIVE ME IDEA WHERE I CAN FIND THAT NEAR OUR HOTEL AND HOW CLOSE IT IS?THANK SO MUCH FOR YOUR HELP. Personally, I would prefer Shamrock hotel. It has a superb location, just steps away from Jordan MTR station, along Nathan Rd the the main thoroughfare in Kowloon where you can easily find shops and restaurants, and it is also very close to the popular street markets. Hi! Can you please help me to choose a hotel between Shamrock hotel and Kimberly hotel in which hotel is accessible to shop i have a 3y/o son with me during our stay.thanks! Sorry, it is not applicable in your case. I checked with Disneyland and verified that the promo is only good for transiting passengers that have a layover time in HK. But correct me if am wrong, the discounted ticket for Disneyland won't apply to us because we will not be leaving the same day or before 2am the following day. Buying a Disneyland ticket and Airport Express (train) Travel Pass online is ok and secure though it needs some extensive verification process that you may find it a bit difficult. If you wanted to get a discounted Disney ticket, you may avail the "In-Transit Ticket for just HK$198" promo, that's 40% savings for the ticket normal price @ HK$399. This promotion is until December 31, 2011 being offered to guests who are arriving and leaving Hong Kong by air on the same day or before 2:00am on the following day. To avail, just proceed to HK Disneyland and simply make your way to guest relations office, located to the left of the main entrance and present your boarding pass and passport for your special priced ticket. For Airport Express trains, there's NO direct route from HK airport to Disneyland. The route would be: Airport Express train from HK airport to Tsing Yi station --> interchange trains to the MTR Tung Chung Line to Sunny Bay station --> interchange trains to the Disneyland Resort Line to Disneyland (total train travel time is 33 minutes @ HK$60). For more information in getting to Hong Kong Disneyland from HK airport, please click here. Would like to ask for your suggestion if it is best to purchase DISNEYLAND TICKETS and AIRPORT EXPRESS TRAVEL PASS thru online? Our schedule would be on Sept 9-12, 2011. And would the express ride be possible from airport to Disneyland? Mirador Mansion location in Tsim Sha Tsui is superb for HK travelers, here's a travel route in getting to TST from HKIA. Aug 15, Mon: HK Airport --> Check in at Hello Inn --> Spend the rest of the night for street market shopping or TST promenade. * Ocean Park --> The Peak --> Open-top bus 15C to Central Pier --> Star Ferry to Tsim sha Tsui --> stroll along TST promenade to visit Avenue of Stars and watch the Symphony of Lights --> walk back to your hotel. Aug 17 and 18, Mon: Macau tourist attractions. * How to get there instruction like Ngong Ping, Ocean Park, to the TST China Hong Kong Ferry terminal, and the other popular attractions, here's to read travel instruction. * 1 day trip to Hongkong attractions. * Suggested Itinerary for 2D Hongkong/1D Macau Trip. My wife and I are visiting HK for the 1st time. Our arrival on the 15th of Aug. 2011 will be 9pm. I already booked at Hello Inn in Mirador Mansion. Our time is limited so can you please give us the best itinerary for 1-2 days only, because we are also planning to go to Macau on the evening of Aug 16 or early morning of 17. Our return flight will be from macau on Aug.18, 2011. I hope you could help us to make our trip memorable. On July 27 upon arrival at HKIA, I assume that you wanted to go straight from HK Airport to the Victoria Peak. The most fast (considering your time is limited) and efficient way to get into the Peak from HKIA is to take the Airport Express train from Airport station to Hong Kong station (24 minutes @ HK$100) and then take exit E2. Upon exit, take a short taxi drive to the Peak Tram terminal, about 5 minutes @ HK$20. Take the Peak Tram up to the Peak @ HK$40 for round trip ticket. Here's a travel instruction in getting to The Peak from HK airport. Take the Peak Tram back to the Peak Tram Lower terminal and nearby you'll find the Peak Tram Bus Terminal. Take the Bus 15C to Central Ferry Pier Bus Terminus, about 10 minutes @ HK$4.2. Walk about 3 minutes to nearby Star Ferry Pier no.7 and take the Star Ferry to Tsim Sha Tsui, 9 minutes @ HK$2.5. Walk about 5 minutes along the TST promenade to visit the Avenue of Stars. Stanford Hotel Hong Kong is a 3-star hotel conveniently located at 118 Soy Street, Mongkok, Kowloon, Hong Kong. Just two blocks away from the famous Ladies Market and about 5 minutes walk to the Mong Kok MTR station Exit E2. Please see map above (scroll up to the post dated "Jun 28, 2011"), just added your hotel location marker to that map and its nearby attractions. Walk about 5 mins to the Tsim Sha Tsui MTR station. Take the Tsuen Wan Line train heading to Tsuen Wan and get off at Mong Kok station (7 minutes @ HK$4.6) and then take Exit E2. Getting to HK Disneyland and Ocean park from Stanford Hotel Hong Kong, please scroll up to the post dated "Jun 28, 2011" above and follow the same routes, only in your case, you'll be taking the Mong Kong MTR station Exit E2 which is the nearest MTR exit to the hotel. You can also apply same route between HK airport and the hotel to that same post above and I recommend taking the bus CTB A21. My family (husband and 3 kids) are going to Hongkong on July 27-30. Just want to ask information on how to go around Hongkong. We will be staying at Stanford Hotel in Soy Street. What would be the best and economical way to go to the hotel considering I have 3 kids traveling with me? July 28 - Disneyland Tour. How to get there from Mongkok MTR Station? July 29 - Ocean park. How to get there from Mongkok? The most efficient way to travel in getting to ANNE BLACK GUEST HOUSE from Disneyland is through MTR trains (same instruction above from ANNE BLACK GUEST HOUSE to HK Disneyland in reverse order). From Disneyland Resort, walk to the nearby Disneyland MTR station and take the train to Sunny Bay station. Interchange trains to the Tung Chung Line heading to Hong Kong station and get off at Lai King station. Interchange trains to the Tsuen Wan Line heading to Central station and get off at Mong Kok station (34 minutes @ HK$17) and then take Exit D3. Walk about 10 minutes to ANNE BLACK GUEST HOUSE, see walking route map above. Would like to inquire how to get to ANNE BLACK GUEST HOUSE from Disneyland. 2. Actually, to maximize your time, you can go straight to Disneyland from Hongkong airport and then check in to your hotel in the evening. Anyway, there are luggage lockers that you can rent at the park to avoid inconvenient when exploring around. * Disneyland, Ngong Ping, Citygate Outlets in Tung Chung, are situated in Lantau island, here's to view map of outlying island tourist attractions. * Ocean Park is situated in northern part of Hong Kong island, here's to view map of tourist attractions within Hong Kong island area. * While Wetland park is situated in northeast New Territories, here's to view map of tourist attractions within New Territories area. 3. If you wanted to explore Ngong Ping then the best option you have (most efficient route) is to take the cable car from Tung Chung. This would be a great and unforgettable experience specially for your kids. Taking a bus will take an hour, and a taxi would cost you around HK$200 or more - not recommended. Or, an alternative for this itinerary is to visit the popular HK Museums. 4. These places of tourist attractions in HK are guaranteed really good for kids based on experience and feed backs; Ocean Park, Wetland Park, and HK Museums specially the ones that are located in TST area, here's to read related topic discussion. * Getting into the TST star Ferry terminal (along the TST promenade) from your hotel is quick and easy. Take MTR trains from Mong Kok to Tsim Sha Tsui station (7 minutes @ HK$4.6) and then take Exit F --> follow directional signs towards Star Ferry Pier for about 5 minutes walk. Avenue of Stars is situated along the TST promenade and a good spot to watch the Symphony of Lights show that starts every 8:00pm (must see attraction while in HK). These HK tourist attractions are free of charge. 1. The "Octopus Card" and the "Airport Express Travel Pass - 1 Airport Express Ride" are different items. a) The "Octopus Card" is a rechargeable stored value smart card used not only for electronic payment in most public transport in Hong Kong (the fare will be automatically deducted from the stored value each time, so you do not have to carry coins) but also for making payment at convenience stores, supermarkets, and fast-food restaurants. Note that there is also an Octopus Card intended for children (age 3 to 11 yrs. old) "Child" that will entitle them half of fares. Each person should have one card. Here's a good video to give you an idea on how important to have an octopus card when traveling around HK (imagine the hassle if you don't have one). b) The "Airport Express Travel Pass - 1 Airport Express Ride" - is a travel package card with fixed price value @ HK$220 (not rechargeable). Each pack includes 1 (one) designated journey (in your case Airport to Kowloon station) on the Airport Express plus 3 consecutive days of unlimited travel on MTR, Light Rail and MTR Bus. c) Or, another option is the "Airport Express Travel Pass - 2 Airport Express Ride" - same package as in (b) only with 2 (two) designated journeys on the Airport Express (@ HK$300). Recommended if you want to take a round trip of Airport Express train between HK airport and your hotel. Thank you for your very comprehensive reply. But, I still have to clarify some things...please bear with me. 1. You mentioned of octopus card. Does this mean, if we are four pax, we have to purchase one each? And this is not reloadable, since all bus,mtr and light rail fares are unlimited for 3 days... and since there is one single journey airport express to our hostel, our concern would only be on how to get to the airport from the hostel. Am i correct? Actually, I tried to book a shuttle bus in going to our hostel, but I find your suggestion economical though. 2. In your first reply, you suggested for a Disneyland tour on our first day which is Sept 9 but our arrival in HK is 9:50 am.. Then we have to transport to check in. Do you think our schedule would still be okey? or any other option please? And am I right that going to Disneyland, Oceanpark, Lantau and Wetland involves the same direction? 3. Actually, I wanted my kids to experience riding cable car... and if there is one in Ocean Park, do you think it will still be nice to ride in Ngong Ping 360? Perhaps, you would have any other suggestion. 4. Is wetland ok for kids? How about Lantau? This tour is for them actually... But I love and excited for the Symphony of Lights... You mentioned of Star Ferry? How to get there from Victoria Harbour? How much would it cost also? And should there be a time limit? I mean, we have to be there before _____? Thank you so, so much for assisting me. Re: 6 days and 5 nights Macau-HK trip itinerary. Here's a travel guide in getting to Ocean Park from your hotel in Tsim Sha Tsui (TST). Also, here's a travel route in getting to the Peak from Ocean Park then to TST promenade. 7 July: Ngong Ping 360 cable car --> Lantau Island tourist attractions --> HK Shopping - Citygate Outlets shopping at Tung Chung. Here's a travel instruction in getting to to Ngong Ping from The Kimberley Hotel. I would advise you buy the round trip ticket when taking the Ngong Ping 360 cable car @ HK$125. 8 July: HK Museums --> theme Street Markets shopping. Here's to read about HK museums around TST area. Getting to Ladies' market (one the most popular themed street market) from The Kimberley Hotel Hong Kong. Take MTR Tsuen Wan Line trains from Tsim Sha Tsui to Mong Kok station and then take Exit D3 (7 minutes @ HK$4.6). 9 July: HK Shopping - shopping places around TST area. Here's my personal itinerary recommendation for your Hong Kong visit. Here's the location map of The Kimberley Hotel Hong Kong and the nearby transportation access points. Upon arrival at HK - Macau Ferry Terminal from Macau, you can take about 10 minutes walk to your hotel or take a short taxi drive straight to your hotel for less than 10 mins @ HK$25. Getting to Disneyland from The Kimberley Hotel Hong Kong. 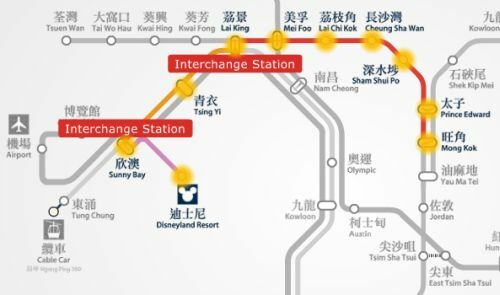 Take MTR Tsuen Wan Line trains from Tsim Sha Tsui to Lai King station --> interchange to Tung Chung Line trains to Sunny Bay station --> interchange to the Disneyland Resort Line train to Disneyland station (38 minutes @ HK$17). Here are some details for your Macau visit. Metropole Hotel is a 3-star hotel located at 493-501 Avenida De Praia Grande, Macau, China. About 20 minutes drive from the Macau International airport and 12 minutes drive to the Macau Ferry Terminal. Here's the location map of Metropole Hotel. Related topic discussion, HONGKONG-MACAU TRIP (first timers) ITINERARY. I'm going to Macau and HK from 4-9 July 2011. I would like to enquire about the itinerary for my holiday with 3 of my friends. On 4 July, our first stop would be at Macau airport at 9.40am. We will be staying at Metropole Hotel (493-501 Avenida Praia Grande Macau) for 1 night. Then, on 5 July, we are planning to go HK by ferry, staying at Kimberly Hotel (28 Kimberly Road, Tsim Sha Tsui Kowloon). We will be flying back home to Singapore on 9 July 11.15am. We would like to go to HK disneyland, Ocean park, and other places of interest as well cheap shopping places. May I know the detailed description of how to get there by public transport? * Grand Century Place at 193 Prince Edward Road West offers a new shopping and dining experience in Mong Kok. It is on the top of the Mong Kok East MTR station and near to the Mong Kok MTR stations and a bus terminal. * The Langham Place Shopping Mall, located in the very heart of Mongkok, is a quintessential 15-storey fashionable landmark of the Kowloon district. Comprising of an area of up to 600,000 square feet, the mall gathers a plethora of spending hot spots, including a myriad of international and local fashion brands, exclusive food & beverage outlets and a cinema. * Tung Choi Street South for Street Market - Ladies' Market. Don't be deceived by the name. Ladies' Market has something for everyone with bargain-priced items, including men's and women's clothing, knick-knacks, watches and beauty products. Open noon - 11:30pm daily. * Street Markets - Temple Street Night Market. This is the famous night market, open 4pm - midnight daily, where you can find all kinds of bargains. Market becomes busy after 7pm. Here are some recommended budget hotel or hostel options. Take about 10 minutes walk from your hotel and get into the nearest Mong Kok MTR station (Exit D3). Take the Tsuen Wan Line trains going to Tsuen Wan and then get off at Mei Foo station. Interchange trains to the West Rail Line going to Tin Shui Wai station and get off to that station (38 minutes @ HK$15.7). At Tin Shui Wai station, take the LRT to Wetland Park station (22 minutes @ HK$4.1). Important: Above fares are based on using an octopus card. If you decide to take the Airport Express trains from HKIA to your hotel then it is ideal to get the Airport Express Travel Pass - 1 Airport Express Single Journey @ HK$220 (includes HK$50 refundable deposit). This pass will entitle you for a single journey of Airport Express PLUS you can enjoy 3 consecutive days of unlimited travel on the MTR, Light Rail and MTR Bus. Please approach the Airport Express counter at HKIA arrival hall for further details about it. * Getting to HK Disneyland by MTR trains. Take about 10 minutes walk from your hotel and get into the nearest Mong Kok MTR station (Exit D3). Take the Tsuen Wan Line trains going to Tsuen Wan and then get off at Lai King station. Interchange trains to the Tung Chung Line going to Tung Chung but you need to get off at Sunny Bay station. Finally, interchange trains to the Disneyland Resort Line to Disneyland station and there's only one exit on that station that will direct you to the Resort entrance. Total train travel time is 38 minutes @ HK$17. * Getting to HK Ocean Park by MTR trains + bus --> The Peak by taxi from Admiralty --> Avenue of Stars and Symphony of Lights by bus then Star Ferry. Take about 10 minutes walk from your hotel and get into the nearest Mong Kok MTR station (Exit D3). Take the Tsuen Wan Line trains going to Central station and just get off at Admiralty station then take Exit B (10 minutes @ HK$9.9). Right upon exit, you'll find the Admiralty (west) Bus Terminus. Take the CityBus CTB 629 that will bring you straight to Ocean Park main entrance (about 25 minutes bus ride @ HK$10.6). Here's a travel instruction in getting from Ocean Park to The Peak. * Getting to Ngong Ping and the rest of Lantau Island attractions by MTR trains + cable car --> back to Tung Chung for dinner and Citygate Outlets shopping. Follow the instruction in getting to Disneyland above and the only difference is that you need to go all the way and get off at the last station, Tung Chung station. Total train travel time is 32 minutes @ HK$14.1. Take Exit B and follow directional signs towards the Ngong Ping Cable Car Terminal (about 4 minutes walk). Take the Ngong Ping Cable Car a stunning 25 minutes (@ HK$115 round trip ticket) cable car ride straight to Ngong Ping. The Anne Black YWCA Guest House Hong Kong is rated 3-star located at No.5 Man Fuk Road, Ho Man Tin, Kowloon, Hong Kong. Here's the location map of Anne Black Guest House and nearby transportation access and other point of interest. It is located near or actually in front of Metropark Hotel Kowloon Hong Kong (a 4-star hotel at 75 Waterloo Road). It is about 10 minutes walk from Mong Kok MTR station Exit D3, and 12 minutes from Mong Kok East station Exit B (this long walk in the busy streets in Mong Kok area is not recommended in your arrival day in HK specially if bringing along with bulky luggage). * by Airport Express train + shuttle bus. This is the most convenient, quickest, and direct route between HK airport and Anne Black Guest House (YWCA) but little bit expensive. Kowloon station Exit B to Metropark Hotel Kowloon (approx 15 minutes) --> take a short walk to your hotel which is located just few steps across the Waterloo Road (pls refer to map above). Here's to read information about Airport Express Shuttle-bus routes from Kowloon MTR station. * by bus + taxi. Most economical transportation between HK airport and Anne Black Guest House (YWCA). Upon exit from arrival hall at HKIA, walk to your right to the HK Airport (Ground Transportation Centre) and take the bus CityBus CTB A21 to Mong Kok, Kowloon CTB A21 bus stop no.6 (start counting Airport (GTC) as bus stop no.1) located at 688 Nathan Road outside Argyle Centre (45 minutes @ HK$33) --> take a taxi to your hotel, should be less than 10 minutes drive @ HK$25 (pls refer to map above). We will be staying at Anne Black Guest House in 5 Man Fuk Road, Kowloon. Hope to get your detailed instruction as to how to get from one place to another including fare rates and map, if applicable. And what do you suggest for a vehicle from airport to our guesthouse/hotel. Sept 9: HK Disneyland (full day). Could get some time in the evening for HK Shopping - Citygate Outlets shopping. Sept 10: Ocean Park (until late afternoon) --> Victoria Peak (until 7:00pm) --> Tsim Sha Tsui promenade to visit Avenue of Stars, see the beautiful view at the Victoria Harbour, and watch the popular Symphony of Lights show that starts at 8:00pm. Sept 11: Ngong Ping 360 and Lantau Island attractions (day time) --> Theme Street Markets shopping (evening). Sept 12: Wetland Park and going to the popular HK Shopping mall (you may choose the ones that close to your hotel). Please provide information to where exactly you'll be staying in Hong Kong (which hotel) so that we can give the specific instruction on how to get to those attractions you've mentioned above from your hotel. Waiting for your reply, just write it down below by hitting the "add comment" link.